Futura Solar, LLC (the Client) has developed two prototype solar energy systems. Testing was performed by Bodycote Materials Testing Canada (BMTC) to evaluate the transient air temperature distribution within the system enclosures and to measure their overall energy performance. Two prototype solar energy systems to be tested were supplied by the Client. The system has a common base (box), with two interchangeable roof designs designated ‘Sawtooth Roof’ and ‘Sloped Roof’. The base is 56 in. wide by 48 in. deep by about 60 in. high, with a solar collector forming the ‘roof’ section, a window on the rear vertical surface, an air intake louver below the window, and a horizontal outlet header located at the top of the solar collector. The roofintegrated air-heating solar collector on the prototype systems has a small air turbine installed in the horizontal outlet header. The air turbine was removed for all tests, because it caused an air flow restriction when not rotating, and because the air flow under natural convection conditions was not sufficient to turn the turbine. The theory of operation of the solar energy systems is described in a confidential draft patent application provided to BMTC by the Client. Digital images of the systems are included in Appendix B. Both prototypes are designed to be mounted onto a building roof to extract air from inside the building, to heat the air extracted from the building, and to admit daylight into the building. The Sawtooth Roof collector base is horizontal (i.e., designed for installation on buildings with flat roofs), with three angled glazed sections with a black-painted wood/metal outlet header on top that collects heated air from each section. Another feature is a wind sensing elbow at the outlet of the collector header, which turns itself away from the wind in order to draw heated air from the collector. It was necessary to remove this elbow for all but the “Maximum Air Flow” test on this prototype. The collector gross area (i.e., sum of the products of length times width for the three glazed slopes) is 12.75 ft², or 1.185 m². During testing only 0.55 % of the glazed area was irradiated, therefore the efficiency calculations were corrected for shading. The Sloped Roof collector design incorporates a black-painted metal outlet header above (but not shading) three separate collector sections, which have clear plastic covers and which are side-by-side. The collector glazing is sloped 35° from horizontal, and the collector gross area (excluding outlet header) is 20.25 ft², or 1.881 m². A Siemens model SM50-H 50 Watt photovoltaic panel is installed under the glazing of each of the three sections. The following information was inscribed on the nameplate of the centre PV panel (the one used for the electrical output measurements described below). The first prototype was subjected to the following tests as discussed with the client on August 14, 2003. Daylighting tests to measure illumination in several locations within the enclosure. The Sawtooth Roof system was fitted with seven (7) type T thermocouples in locations agreed upon between the Client and BMTC, which included four (4) shielded thermocouples for air temperature measurements inside the system enclosure and three (3) unshielded thermocouples in the horizontal outlet header. The shielded air temperature thermocouples were located at the centre of the enclosure at 16, 32, 48 and 65 inch heights from the ‘floor’. One unshielded thermocouple was centred in the outlet header air stream of each of the three glazed collector sections. The system was sealed with foil tape and RTV sealant to minimize air leakage, then the walls and base were insulated on the outer side with 2 inch thick rigid foam. The system was then positioned in the solar simulator chamber at an ambient air temperature of 20 °C (68 °F) and exposed to simulated solar radiation applied at an incident angle of 40° down from horizontal. The average irradiance level, measured at six points on the Sawtooth Roof, was 1030 W/m². When thermal equilibrium was reached, three traverses, as per diagram D-10B on p. 64 of ASHRAE Standard 111-1988, were made across the 8 inch diameter outlet duct using a calibrated hot-wire air velocity meter (MII# A10835). The pivoting elbow at the outlet of the collector header was then removed, and Bodycote’s conditioned airflow test apparatus was connected to the prototype system for tests of system thermal output versus airflow rate through the system. Conditioned air at 70 °F (21 °C) was drawn through the system using a controlled speed centrifugal fan. Mass flow was measured using a calibrated laminar flow element (MII# B00610) and a calibrated micromanometer (MII# A08069). Average incident solar irradiance was recorded and maintained at approximately 900 W/m² during the test. System energy output was measured at three different airflow rates at each of two different ambient air temperatures. In order to perform the daylighting tests, the system was moved outdoors and the base was sealed to minimize the light entering the enclosure other than through the roof. The light levels were then measured in fifteen locations within the enclosure using a calibrated precision lightmeter (MII# B05851). The readings were taken near 12:30 PM on 2003-Sep-09 under clear sky conditions, with the collector sections turned to face the sun. The light level readings were taken in a horizontal plane 16” below the roof level. The outdoor solar irradiance on a southfacing surface tilted 45° from horizontal was also recorded. The system was configured to the Sloped Roof design and fitted with three (3) shielded type T thermocouples for air temperature measurements inside the system enclosure. The shielded air temperature thermocouples were located at the centre of the enclosure at 16” and 32” heights from the ‘floor’, and at the opening into the centre collector section. (This opening is at the upper edge of the collector section, so that it extracts air from the “room” at the highest point below the roof.) An additional type T thermocouple was attached at the rear centre of the PV module. The system was sealed with foil tape and RTV sealant to minimize air leakage, then the walls and base were insulated with 2” rigid foam on the outer sides. The system was then positioned in the Solar Simulator chamber and connected to Bodycote’s conditioned airflow test apparatus for thermal efficiency testing. Insulated inlet and outlet connections that incorporate fluid temperature sensors were attached. Simulated solar radiation was applied at an incident angle of 40° down from horizontal. Solar irradiance was measured with a pyranometer mounted beside the system under test. An irradiance uniformity scan in the plane of the collector was done in order to relate the irradiance at the pyranometer position to the average solar irradiance incident on the collector aperture, which was then maintained at approximately 900 W/m². System energy output was measured at the same conditions used for testing the Sawtooth Roof design. Three PV panels were installed below the glazing of this prototype system. The electrical output of only one PV panel—the one in the central section of the prototype—was measured. After each of the six thermal performance measurements was completed, and while steady state conditions were maintained with approximately 900 W/m2 solar irradiance, the electrical output of the PV panel was measured. For each determination of PV panel electrical output, the following data were recorded. The near-short-circuit current was measured using a current shunt, so there was a small positive voltage across the PV panel for that measurement (as recorded in the Results section of this report). A Kikisui electronic load (MII# A08927) was used to adjust the current draw from the PV panel until the desired PV panel voltage was achieved during measurement of the PV current output at near rated voltage. The temperatures measured during the Maximum Air Flow test are graphed in Figure 1 in Appendix A. The graph shows that the air temperatures below the solar roof are representative of what one might expect for a standard building with a high open ceiling. The air is relatively mixed at the lower levels (16 inches to 48 inches from the floor), with the hot air (30 °C) confined to the upper air layer just under the solar roof. The average airflow rate under natural convection conditions was measured to be 7.8 ± 3.9 cfm. Based on the gross collector area of 12.75 ft², this measured natural convection airflow rate is 0.6 ± 0.3 cfm/ft². Thermal efficiency tests were performed at airflow rates of 0.6 cfm/ft², 1 cfm/ft² and 2 cfm/ft², at chamber ambient air temperatures of approximately 70 °F (21 °C) and 40 °F (4.5 °C). Inlet air to the side of the prototype box was conditioned to 70 °F (21 °C) for all tests. Collector efficiency was calculated based on the net irradiated area 7.07 ft² (=12.75 ft² × 0.555) of the Sawtooth Roof collector, using average measured data. Test data are reported in Table 1, and temperature measurements are included in Appendix A. The average of fifteen light readings measured in a horizontal plane 16 inches below the roof level was 840 lux. The roof level is defined as the horizontal plane at the bottom of the sawtooth solar collectors. The outdoor solar irradiance on a south-facing surface tilted 45° from horizontal was 1014 W/m² during the measurement period. Thermal efficiency tests were performed at airflow rates of 0.6 cfm/ft², 1 cfm/ft² and 2 cfm/ft², at chamber ambient air temperatures of approximately 70 °F (21 °C) and 40 °F (4.5 °C). Collector efficiency was calculated based on the gross area (20.25 ft²) of the Sloped Roof collector, using average measured data. Test data are reported in Table 2 below, and temperature measurements are included in Appendix A. The electrical measurements and calculated module current outputs are presented in Table 3. Table 3. PV module electrical measurements recorded during Sloped Roof collector testing. electrical energy from integrated photovoltaic panels. All four of these benefits have been verified and quantified, under defined test conditions, for the prototypes described in this report. These benefits would be useful at different times of the year. For example, the natural ventilation effect would be useful in the summer time, while the heated air would be useful for space heating during the heating season if the air flowing through the solar collector was recirculated back into the building. Figure 1 in Appendix A shows that, under the natural convection conditions that this test was conducted, the air temperatures below the solar roof are representative of what one might expect for a standard open building. The air is relatively constant temperature (about 24 °C) at the lower levels (16 inches to 48 inches from the floor), with the hot air (30 °C) confined to the upper air layer just under the solar roof. This first test showed that the configuration of the prototype was able to extract 7.8 ± 3.9 cfm from the model “building” that the prototype solar roof was built on. Using a collector area of 12.75 ft², this represents a natural convection airflow rate of 0.6 ± 0.3 cfm/ft². The relatively high uncertainty on this value is due to the very low free convection flow velocity. A larger (full scale) solar roof would be expected to produce a correspondingly larger air flow rate. As noted in previous sections of this report, only about 55% of the collector aperture area was irradiated; the rest was shaded by parts of the roof closer to the light source. In a full-size solar roof, the solar collectors may be spaced apart farther to reduce the amount of shading, in which case the flow rate of air out of the building would be expected to be greater than the 0.6 ± 0.3 cfm/ft² measured for this prototype. The maximum air temperature reached by the air exiting the Sawtooth prototype was 46 °C, and the maximum air temperature exiting the Sloped prototype was 68 °C. These high temperatures demonstrated the ability of the prototypes to produce the desired effect of heating air. The efficiency was measured for each prototype at three different flow rates and two different ambient temperatures. The thermal efficiency of the Sawtooth prototype was measured to be between 12% and 37%. The thermal efficiency of the Sloped prototype was measured to be between 8% and 32%. The thermal efficiency of both prototypes were seen to be dependent upon air flow rate and outdoor ambient air temperature, as would be expected of any solar thermal collector. The measured efficiencies of the prototype solar roofs—both the Sawtooth and the Sloped—are lower than the thermal efficiencies of more conventional air-heating solar collectors. Both the lack of insulation on the sides of the “collector plenums” on top of the solar absorbers and the shading seen on the Sawtooth design (see Appendix B) would contribute to the low efficiencies measured. The limited number of test points were not sufficient to produce the standard type of solar collector efficiency curves normally associated with solar collector testing (e.g. 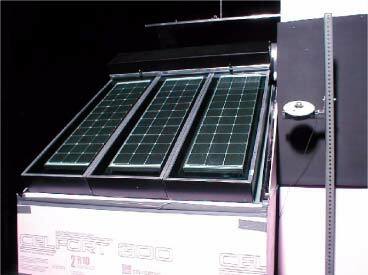 as described in the solar collector rating method of SRCC OG-100). 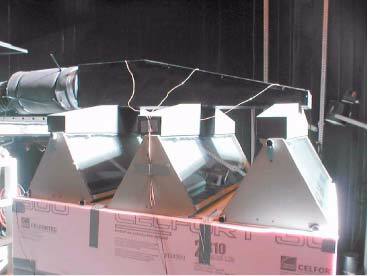 Moreover, the construction of the prototypes made it difficult to separate the solar collector part from the simulated building part (referred to as the box) of the prototypes. In particular, Bodycote’s test apparatus delivered the inlet air into the side of the prototype rather than directly into the solar collector. 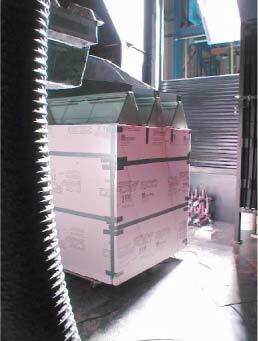 That resulted in a temperature difference between the air entering the prototype and the air entering the collector proper, since the air experienced some temperature change due to heat losses or gains through the side walls of the “box”. Air leakage from the prototypes was also identified during the testing, and an attempt was made to minimize that leakage. In a real implementation of this design, it should be possible to provide both better air seals and better insulation. Overhead daylighting from a north-facing clerestory, such as demonstrated in the Sawtooth prototype, is a well-understood architectural feature. The prototype tested in the present work was demonstrated to admit an illumination of 840 lux on a horizontal plane inside the model “building” 16 inches below the bottom of the bottom of the sawtooth solar collectors during midday clear sky conditions. For comparison, the National Building Code of Canada requires that minimum lighting levels be 100 lux in recreation rooms and public washrooms, and 200 lux in laundry rooms and service areas. As a general rule, light levels decrease with distance from the light source. In the case of the prototype tested here, the light source is the clear glazed area of the clerestory windows built into the solar collectors. Lighting levels at the floor level in a real building equipped with the Sawtooth collector design will depend upon (as well as outdoor natural illumination levels) the height of the roof, the area of the clerestory glazing compared to the floor area, and the geometry and colour of the room being illuminated. The electrical energy produced by the PV panels installed inside the sloped roof prototype is summarized in Table 4. The temperatures measured on the back of the PV panels should be close to the PV cell operating temperatures. These cell operating temperatures can be seen to be very high at the low airflow rate of 0.6 cfm/ft2, and decrease with increasing airflow rate. The solar irradiance during these tests was 89% of the solar irradiance used in rating PV panels. Both the high cell temperatures and the lower test irradiance contribute to the observed low electrical output of the test panel compared to its rated electrical output of 50 W.
Dr. Alfred P. Brunger, P. Eng. This report refers only to the particular samples, units, material, instrument, or other subject used and referred to in it, and is limited by the tests and/or analyses performed. Similar articles may not be of like quality, and other testing and/or analysis programs might be desirable and might give different results. Figure 1. Air temperatures recorded during Maximum Airflow test on the Sawtooth collector. Figure 2. Air temperatures recorded during first thermal efficiency test. Figure 3. Air temperatures recorded during second thermal efficiency test. Figure 4. Air temperatures recorded during third thermal efficiency test. Figure 5. Air temperatures recorded during fourth thermal efficiency test. Figure 6. Air temperatures recorded during fifth thermal efficiency test. Figure 7. Air temperatures recorded during sixth thermal efficiency test. Figure 8. Air temperatures recorded during first thermal efficiency test of Sloped Roof collector. Figure 9. Air temperatures recorded during second and third thermal efficiency tests. Figure 10. Air temperatures recorded during fourth thermal efficiency test. Figure 11. Air temperatures recorded during fifth thermal efficiency test. Figure 12. Air temperatures recorded during sixth thermal efficiency test.